Pakistani President Pervez Musharraf has lifted a state of emergency and restored the country's constitution. The move will be welcomed by Western nations ahead of national elections on 8 January, but domestic opponents gave it a cautious welcome. 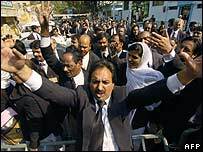 Mr Musharraf imposed the emergency in November, arresting hundreds of people and replacing Supreme Court justices. Elsewhere, a suicide bomber on a bicycle killed five people outside an army base in north-western Pakistan. Two soldiers and three civilians died, in addition to the bomber. The attack, which left six injured, happened at the gates of an army services centre in Nowshehra, 120km (75 miles) north-west of Islamabad. 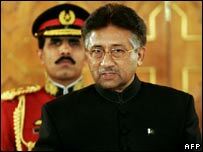 Pervez Musharraf formally ended the country's state of emergency one day earlier than he announced. His first act upon restoring the constitution was to swear in new members of Pakistan's Supreme Court, giving the oath of office to new Chief Justice Abdul Hameed Dogar. Iftikhar Chaudhry, the sacked former chief justice, remains under house arrest. The president's position had seemed in peril when he declared the state of emergency, says the BBC's Jill McGivering, in Islamabad. Under Mr Chaudhry, the country's top judges seemed about to declare his re-election as president illegal because he had refused to step down from his role as head of the army. He later relinquished that role and was confirmed as president for a new term by the remodelled Supreme Court. Independent judges have been sacked and replaced, and media freedom has been curtailed, and Mr Musharraf's position is now more secure, our correspondent says. Two former prime ministers, Benazir Bhutto and Nawaz Sharif, have returned to Pakistan from exile recently and plan to contest January's elections. The two head separate parties and failed to agree on a joint boycott of the polls, so have pledged to fight Mr Musharraf at the ballot box. Ms Bhutto said the lifting of the emergency was an "important step forward", but said more needed to be done before Pakistan's democracy was fully restored. UK Prime Minister Gordon Brown said the move was a "significant step towards the return of full constitutional order", but said he had told Mr Musharraf that January's elections must be free, fair and transparent.